Whether you’re managing risk, safety or insurance programs, your job is more challenging than ever. More data. Increased business complexity. Greater security risks. Heightened expectations. Less time to respond, and with fewer resources. You need a technology solution that meets today’s needs while demonstrating the ability to meet tomorrow’s challenges, too. The answer is Ventiv IRM. Built upon completely re-envisioned technology, from the browser all the way back to the server, Ventiv IRM gives risk managers everything they want from a risk platform: the industry’s best analytics and reporting; blazing-fast speed and responsiveness; automation and a user experience that supports risk managers in how they want to work, view and analyze data, and make information-based risk and insurance decisions. The right risk management information system is much more than just an aggregator of claims and policy data. It’s a risk analytics system. Ventiv IRM improves and simplifies the evaluation, mitigation, and monitoring of risk with powerful analytics, data-discovery, and reporting capabilities. 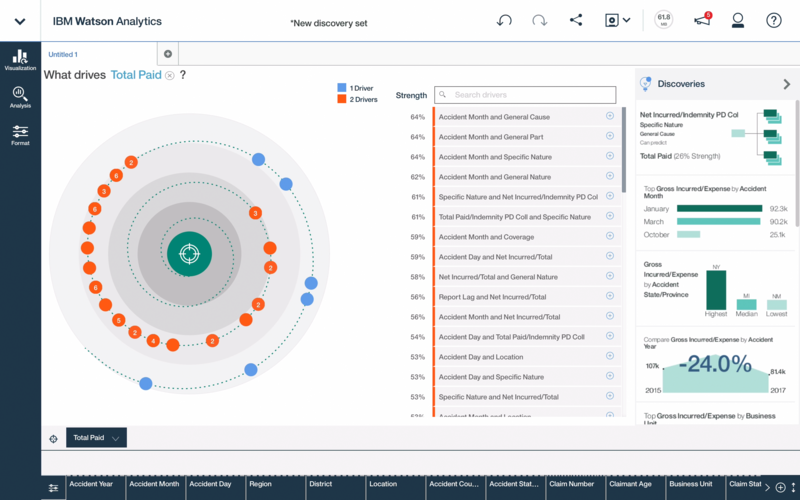 As today’s risk environment changes to encompass a diverse, critical range of enterprise and large scale risks, no risk manager can afford to be without powerful analytics tools. 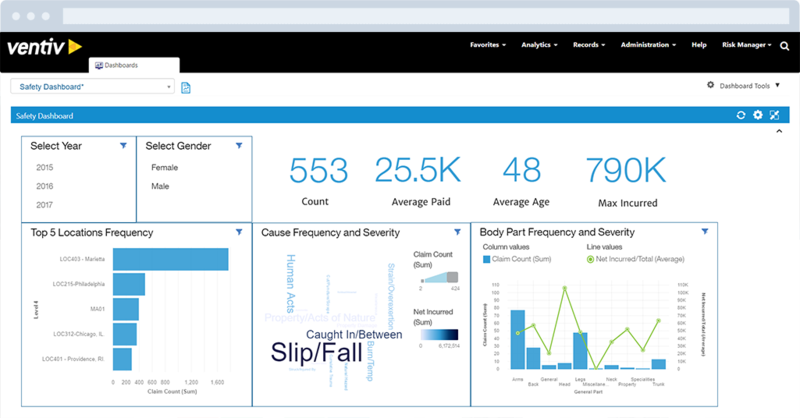 Ventiv is the only RMIS provider offering cutting-edge advanced analytics embedded and integrated into our applications. When you add it up, Ventiv's comprehensive analytics, reporting, and data-discovery empowers you to make data-driven decisions that generate optimal outcomes like reducing claim frequency and severity. With Ventiv Analytics and Ventiv IRM, business users like you become data scientists in your own right. As a modular system, it's easy to get started tackling key priorities right out of the box. Ventiv IRM can be tailored to your business requirements. And, as your business needs change, our solution grows and adapts with you. Allow your managers to focus on their core business. Ventiv IRM allows you to effectively manage the complete incident lifecycle. Capture all incidents, notify and escalate to management, investigate and identify root causes, use analytics to identify the best corrective measures for your budget. Take control of your claims and drive your premiums down. Ventiv IRM allows you to be in control of your claim situation with one central repository with reduced reporting costs and automatic consolidation from TPAs/insurers. Optimize your process and gain analytic insights to operational and financial performance. A centralized repository enables a stronger negotiating position for risk transfer. Ventiv IRM allows you to maintain a detailed register of all exposures/assets, including properties with their location, usage, values and COPE details. Understand the global profile of your risks and secure the best premium rates. Improve the efficiency of insurance renewal data collection and optimize program design. Ventiv IRM streamlines the renewal of insurance policies by automating the collection, consolidation and analysis of your organization’s risk and exposure data. Get up to 75% more time for planning optimal program design. Move to a proactive risk improvement program with best use of loss control budgets. Ventiv IRM enables improved survey program management through a central repository of survey results, including recommendations and temporary impairments. With monitoring and analytic insights to help your risk improvement decision making. Provide an efficient, transparent, compliant and risk aware process to help embed risk management.Ventiv IRM provides a robust framework to accurately allocate premiums, retained claim costs or other risk management costs. Provide objective and transparent models to justify to business units and for audit compliance. A holistic approach to managing policies and insurance programs.Ventiv IRM manages your organization’s insurance policies, including premiums, limits & conditions, loss ratios, aggregate erosion, premium flows, and insurer exposure. With analytics and oversight to help ensure adequate coverage plus maximize the coverage for your premium spend. Empowering the managing of risk across your enterprise.Ventiv IRM provides improved management of risk and alignment with your ERM framework, including identification, assessments, controls and actions. With easy consolidation, aggregation, linkage, and reporting on the risk landscape, progress and movements. All facilitating the maximum value from your ERM process. Monitor and proactively optimize your and external vendor performance.Ventiv IRM allows you to proactively manage against your objectives and key performance indicators (like TCOR) to help drive results and operational excellence. Integrate your RiskConsole information with additional business context information to allow the best decisions to be made. Increase the effectiveness of your EHS program with Ventiv IRM. 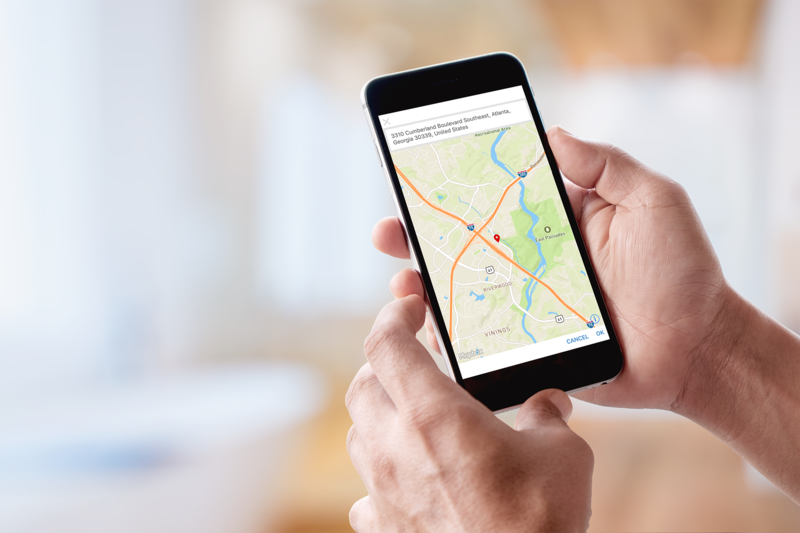 Capture all types of incidents, near misses and observations. Investigate, identify root causes and take corrective action. Successfully target your loss control measures, drive best practice and compliance with local legislation (OSHA, RIDDOR). Integrate with audits and safety meetings. And, how do I know if I need one? 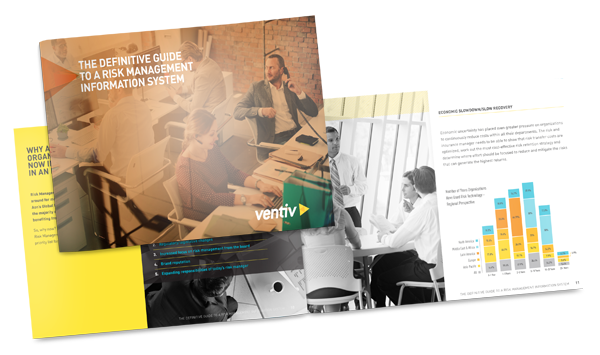 This guide is packed with insights from industry research, and practical worksheets to determine if your organization needs a RMIS and the value it can provide.